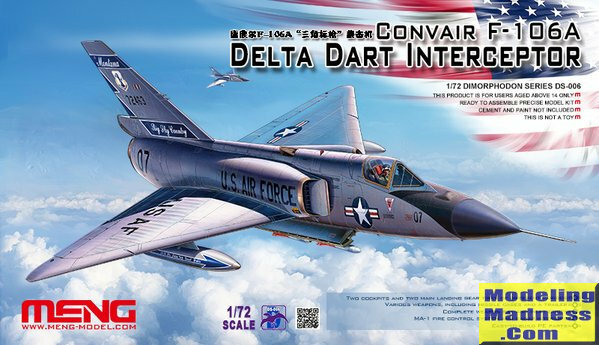 The Convair F-106 Delta Dart was the primary all-weather interceptor aircraft of the United States Air Force from the 1960s through the 1980s. Designed as the so-called "Ultimate Interceptor", it proved to be the last dedicated interceptor in U.S. Air Force service to date. It was gradually retired during the 1980s, with the QF-106 drone conversions of the aircraft being used until 1998 under the Pacer Six Program. 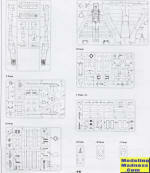 Over the years, many modelers have hoped for a new tooling of the F-106 in 1/72 scale. Not that there is anything particularly bad about the only kit on the market by Hasegawa, but it is a kit of the early 70's and shows its age in the lack of the sort of detail that modern modelers expect. When Meng produced its F-102 a few years back (much to the delight of Century Series fans), it was hoped that they'd extend their range to the F-106 and so they have. Thanks to our friend in China, Richard F, I'm able to see this new kit in the flesh and can tell you that it is all that we have hoped for. You would expect the kit to have a lot of detail and to be modular and it is in both accounts. First off, it is molded in a rather dark grey plastic. The molding is excellent and there should be no complaints about the external detailing. 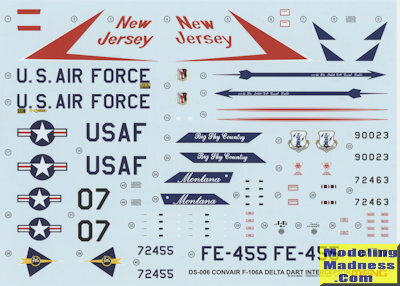 Meng has provided bits to do either an early or later version of the F-106A. It starts in the cockpit with either a Convair bang seat or the later Weber zero-zero seat. The instrument panel can be either the older round dial or the strip style instruments. A p.e. panel is provided for both options. Convair's dual grip control column is also included. Rudder pedals are molded onto the instrument panel piece. This all fits into a tub that sits atop the nose gear well once the well walls have been attached. Meng has provided full intake trunking that stops at the first compressor stage of the engine. Conversely, the exhaust section starts at the last compressor stage and includes the burner. These are trapped between two full fuselage halves. This means that an F-106B will also have full length fuselage halves, something I like. Intakes are an outer piece and a splitter plate. Meng has designed the forward fuselage to have open panels for the MA-1 fire control system and also includes a full radar antenna. Wings are a one piece lower and a one piece upper wing section. The main gear bay pieces are trapped between the two. The lower section includes the missile bay. For those wanting to close this up, a piece is provided to allow that to be done. The aft section of the wings have separate elevons that can be posed either neutral or slightly lowered. For this purpose, two different elevon actuator fairings are provided. At the back, the speed brakes can be posed open or closed. For the closed position, a bit of surgery needs to be done. These were frequently open on the ground as I believe the parabrake fit inside. The fin and most of the upper fuselage spine are separate items, though I'm not really sure why. Main landing gear are nicely done one one has the choice of two different style wheels. Throughout the instructions, you are told which marking option uses which bits. 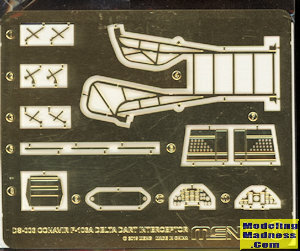 The missile bay is properly complex with the missile rail assemblies being nicely molded. 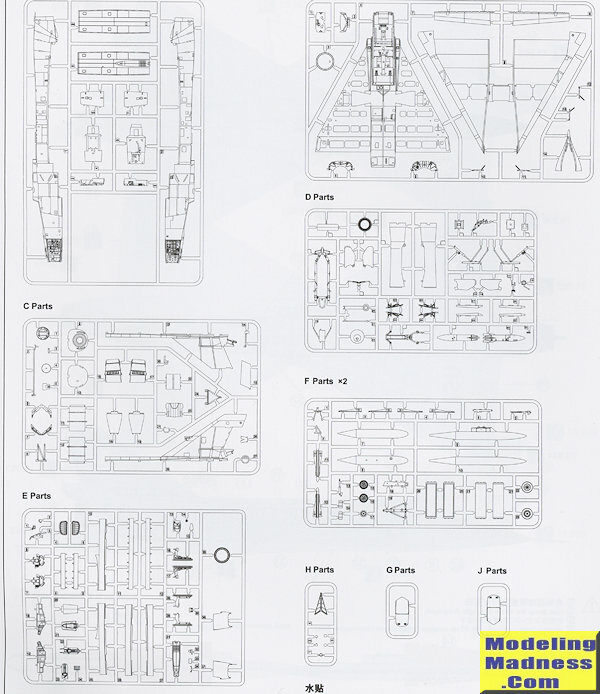 This kit offers the option for the gun that was fit to later F-106s, something that we've not seen in an F-106 kit prior. One of the closed door options includes this gun fairing. The open option also has it. For weapons, you have two AIM-4F and two AIM-4G Falcons as well as a nuclear AIR-2 Genie. There is a transport dolly for the Genie if you don't want to mount it. For the Falcons, transport cases are included as well. Other options are small or large underwing tanks, open or closed canopy, early or late canopy style, IR seeker raised or lowered, and you can close the nose and forward fuselage avionics doors should you wish a clean airframe. A photo etch fret is included that provides a boarding ladder and a number of other bits, mostly used in the missile bay and cockpit. Instructions are very nicely done with color information using Vallejo paints. Decals are for three planes. All are in overall ADC Grey with black noses and anti-glare panels. One is an older plane from the 539 FIS at McGuire AFB in 1960. The other two are ANG planes, both from units that were among the last to fly the plane. One is from the 186 FIS, Montana ANG and the other from the 119 FIS, New Jersey ANG. Note that the Montana planes experimented with the blue-green cockpit interior color used by the Soviets in their MiGs. Decals are nicely printed with full stencils. Below are images of the two ANG options. Though not inexpensive, it is a most welcome kit for fans of the aircraft. If you don't like the schemes provided, there have been a lot of decals printed over the years for the Hasegawa kit and I see no reason why they would not fit this one with a bit of effort. Thanks to Richard F for providing the preview kit.